InsideHigherEd.com—an online trade publication for higher education—released today its own picks for the NCAA Women’s Basketball Tournament Bracket based solely on academic standards, and the Belmont Bruins made it all the way to the Championship game. 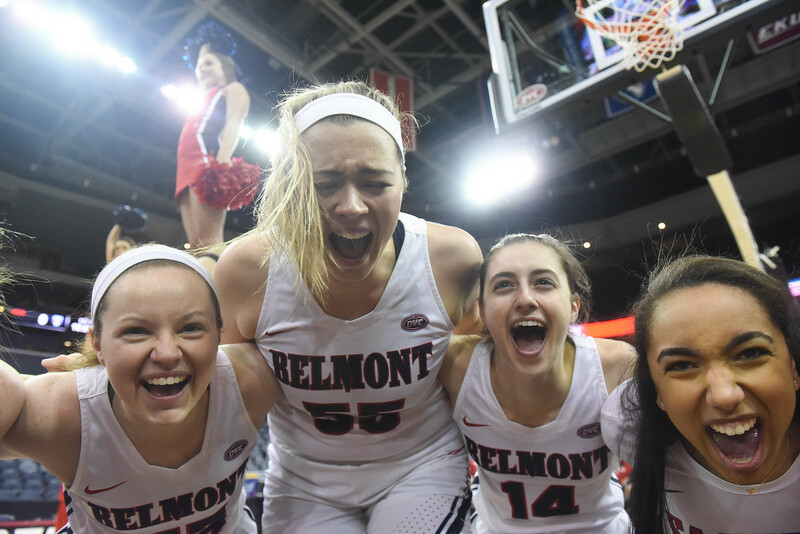 On the road to the Championship, Belmont “defeated” some fellow academic powerhouses, including Friday’s opponent South Carolina, as well as North Carolina, Bucknell, Kentucky and Texas. Belmont’s only loss was in the title game to Stanford University. The Belmont men’s team was named winner yesterday of their Academic Bracket on InsideHigherEd.com. Beyond their academic chops, the Bruins (26-6) demonstrate amazingly consistent talent on the court as well, winning their fourth straight OVC tournament championship March 9. The team departs Wednesday for Charlotte, North Carolina and their first round game in the Big Dance versus the South Carolina Gamecocks. Belmont Women win the OVC Tournament over UT Martin 59-53 in Evansville, KY on March 9, 2019. Belmont women’s basketball has been named a Women’s Basketball Coaches Association (WBCA) Academic Top 25 Honor Roll Team in each of the past five years with team cumulative GPAs above 3.4 each year. Belmont WBB had a team 3.595 GPA in 2017-18, its highest cumulative GPA in that stretch, which ranked 13th among WBB teams nationally at the NCAA Division I level. Belmont is led by senior Jenny Roy, a 2018-19 CoSIDA Academic All-District honoree and OVC Academic Medal of Honor recipient. She is a marketing major with a 3.98 cumulative GPA. Belmont has won four straight Ohio Valley Conference championships and joins perennial national power UConn as the only teams in the nation to have won their past four conference tournament titles. Belmont has won four straight conference tournament championships for the first time in the program’s NCAA era. The Bruins rank fourth in the nation in made 3-pointers with 10.4 per game. The Bruins have won at least­ 26 games in three consecutive seasons and have at least 24 wins in each of the past four seasons. For more information on the Inside Higher Ed bracket, click here. Tip-off Friday for the Belmont Bruins versus the South Carolina Gamecocks is set for 12:45 p.m. CT from Charlotte, North Carolina, and the game will be broadcast on ESPN2.